Teacher/Coach Steven Puia has already put his team into a training schedule since arriving in Honiara on Sunday and wants to bury his province’s demons from the past. 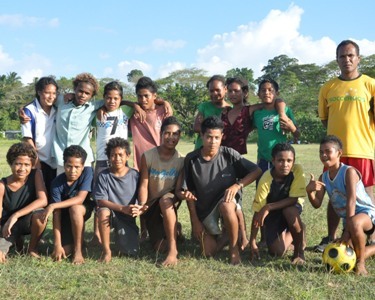 “Traditionally, we are known as a rugby province but we are focused on performing well in this year’s event and show to everybody that our kids also love football,” Puia said in an interview with the Solomon Islands Football Federation (SIFF) Media Office. The team is having 2 training sessions per day as they go through a crash course in football before the competition matches kick off Tuesday next week. To bolster their case they have engaged the services of former national team goalkeeper Severino Aefi, who is assisting the team with basic football training to help them in their preparations. Aefi says that the members of the team are not new to football but anyone can benefit from training so they are making use of their early arrival in Honiara to prepare. “I see great promise in these kids. Technically, they might not match up with the Honiara teams but their energy and enthusiasm is so much higher,” Aefi said. For most of the kids in the Vanua Primary School team this is their first time to leave their families let alone their first time to even leave their villages. Puia also said that his school is fully geared up for the cultural night event. They have brought over with them all their traditional costumes from their village and are confident that they will be one of the best performers this year. This is welcome news for the Our Telekom National Kids Football, Cultural Exchange & Education Festival Local Organising Committee who aim to make this year’s cultural night program even bigger than the 2009 one. Vice-chairperson Joseph Boso, said that the regulations for the cultural dances will be stricter than in 2009 and learning that Vanua has prepared well for the program is what the organising committee wants to hear. Puia said overall the objective of Vanua Primary School as a participant is to experience the festival and bring back home the best they can gather from it. The integration of the Just Play program in the kids football festival is of particular interest for them. Vanua Primary School hails from Lavagu in West Rennel in the Rennell and Bellona Province. Rennell and Bellona people are Polynesians and share a cultural heritage similar to that of the Maoris in New Zealand. The most popular sport in the Rennell and Bellona Province is rugby but interest in football continues to grow there. SIFF is hoping that a development program like the Our Telekom National Kids Football, Cultural Exchange & Education Festival will contribute to bringing football to newer heights there.